The Narendra Modi government is working for 'making India' whereas the Congress is working for 'breaking India', Bharatiya Janata Party president Amit Shah said on Saturday, asserting that his party will return to power in 2019 with a majority bigger than what it got in 2014. Launching a blistering attack on the Opposition in his inaugural address at the party's two-day national executive meeting, he said the proposed 'mahagathbandhan' (grand alliance) of the BJP's rivals is an illusion and myth, and will make no difference to its fortunes. Shah sought to build a narrative about his party around the theme of development, especially targeting the poor, and nationalism, while painting the Opposition as those sympathising with 'urban Naxals' and working for 'breaking India' in its frustration over electoral losses. Briefing reporters on Shah's speech in the closed-door meeting, Union minister Nirmala Sitharaman said he termed the Opposition as 'disruptionists' and that it no longer seems to be representing the voice of the people. He made these comments in the context of the no-confidence motion brought by opposition parties in Lok Sabha in the Monsoon Session, saying that there was no reason for it and accusing them of being in 'denial mode' after it was defeated with a big margin. With many political watchers suggesting that the BJP may find it hard to repeat its 2014 feat, Shah said it will handily win in 19 states where it is in power and also emerge victorious in states such as West Bengal, Odisha and Telangana due to 'anti-incumbency' factor against regional parties in power there. "We will return to power strongly and with a good majority. We will win with a bigger majority than what we got in 2014," Sitharaman quoted him as saying. 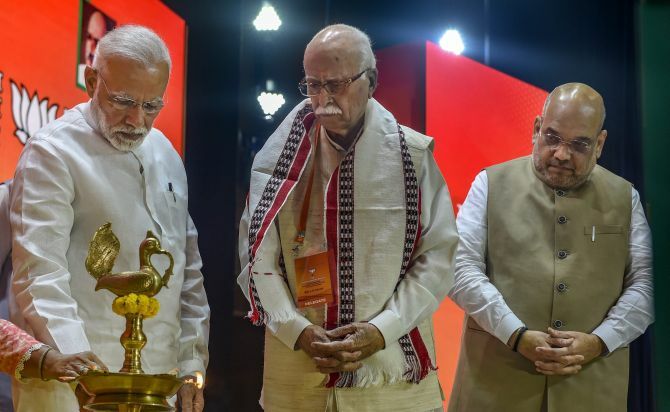 Top party leaders, including Prime Minister Narendra Modi and chief ministers of party-ruled states, were in attendance as Shah asserted that it will return to power on the basis of the government's performance, Modi's charismatic leadership and its organisational strength. Amid unity efforts among opposition parties to challenge the BJP, Shah said his party had defeated all of them in 2014 and their coming together will make no difference to it. He also took a dig at Congress leader and former prime minister Manmohan Singh, who had recently said that the Modi government had failed on all fronts, saying that while Singh follows his party, Modi leads his. Hitting back at former finance minister P Chidambaram over his criticism of the government's economic policies, especially demonetisation, Shah said over 3 lakh shell companies were shut down hampering black money operations and the numbers of income tax assesses have doubled. "Our workers should take on P Chidambaram and company and challenge them for debates on facts," he said. Shah also touched on the issues of National Register of Citizens (NRC) and triple talaq bill while making a passing reference to his rivals' attack on the party over Dalit issues but avoided the topics of oil price rise and reported upper castes anger over the BJP's support for pro-Dalit laws. Not a single infiltrator will be allowed into India, he said, noting that the party has been consistent in its support to the NRC with its part national executives making a mention of it as many as nine times. He also made a strong pitch for the Citizenship (Amendment) Bill that seeks to grant Indian citizenship to minorities being persecuted in neighbouring countries, saying it must be done without any hesitation. Shah also made a reference to the instant triple talaq being banned in several Islamic countries and said the bill, which envisages criminal action against Muslim men accused of practising it, has been stuck in Parliament due to the Congress's 'hypocritical' stand. Speaking for the first time on the raging controversy over the arrest of several activists on the charge that they helped Naxals, he praised Maharashtra Chief Minister Devendra Fadnavis, who was present, for the police action. Opposition parties such as the Congress are doing vote bank politics on it, he said. The BJP's rivals have been making "baseless" allegations against it over Dalit issues, he said. Referring to pro-poor programmes of the government, Shah said it has lived the party's ideologue Deendayal Upadhyaya's principle of 'antyodaya' (uplift of the last man in queue) by benefitting over 50 crore people with its 126 schemes. He asked party workers to go to villages covered under 'Gram Swaraj' (village empowerment) scheme of the government and celebrate Diwali with residents. The party will showcase its organisational prowess in the 2019 polls, he said, asking its functionaries to go to the masses with details of the government's works. 'Shaurya Diwas', and hold 'sewa saptah' (service week) between September 17 and 25. He also hailed the passage of a bill granting constitutional status to a commission for Other Backward Classes and claimed that the government's works have touched on all segments of society. Shah, whose three-year term ends in January next year, will lead the party in the Lok Sabha election in 2019 and its organisational polls are likely to be suspended till then as it focuses on the electoral challenge ahead, party sources said. The party sources said on the sidelines of the national executive meeting that Shah will lead the organisation into the Lok Sabha polls, scheduled for April-May next year. The issue was discussed in the meeting of office-bearers, they said. Shah had replaced Rajnath Singh as the party president soon after it came to power in May 2014 as Singh quit his post following his inclusion in Prime Minister Narendra Modi's cabinet. He was then elected as the president in January 2016. The BJP's constitution allows its president to serve two consecutive full terms of three years each. As such, Shah can be elected to the post for one more term.